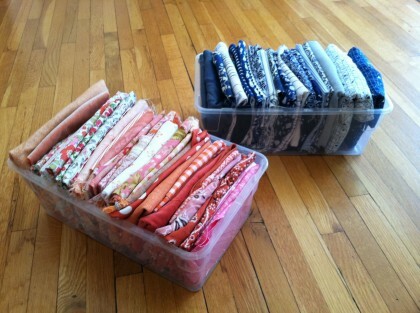 I’ve had a pile of fabric sitting in the corner of my room for about 6 months. And I finally came up with an idea for storing it. Here, they put fabric pieces in clear shoe boxes, but I found it not as crisp as I wanted, if you get me. I can imagine putting fabric in and taking it out leads to smashed down fabric and a mess. 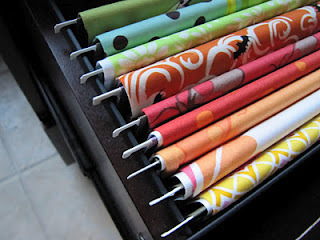 So I decided to use hanging file folders. Of course, once I’d done all that, I found someone else online who did a nice job with a similar system. I’ll show you that at the end. For now, behold my solution! 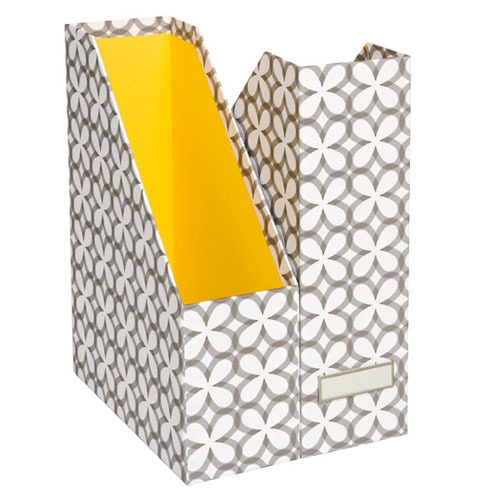 I bought a clear, freestanding file folder container at The Container Store. 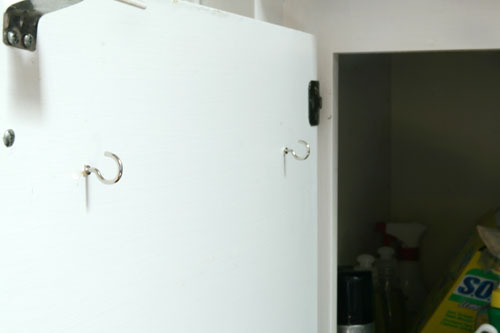 There were also watertight versions that were quite a bit more expensive, but if you wanted to store your fabric in the garage or the basement, that would be a good option. 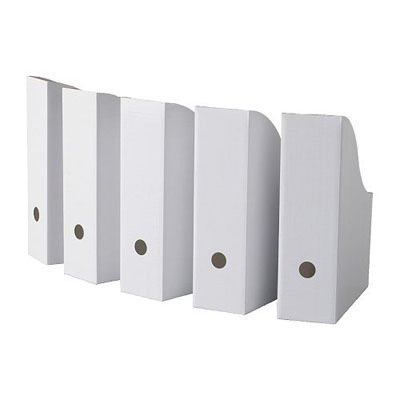 I got a bunch of hanging file folders as well. 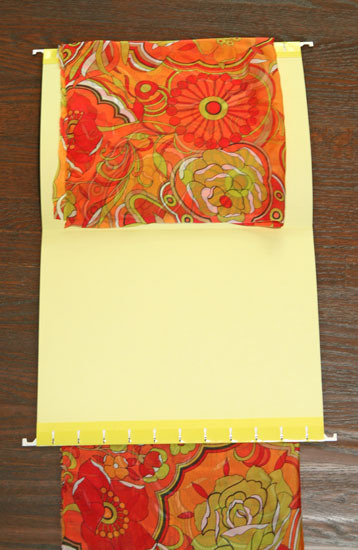 Then, I put each fabric in and around a file folder. 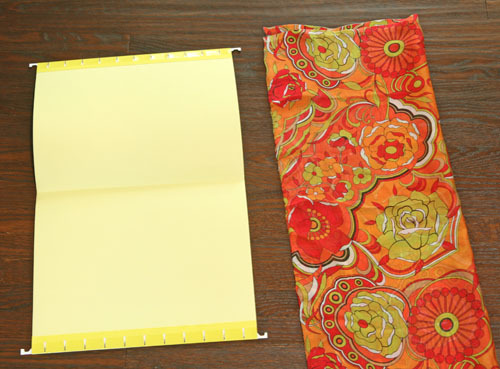 First, you fold your fabric so that its width is not wider than your folder. 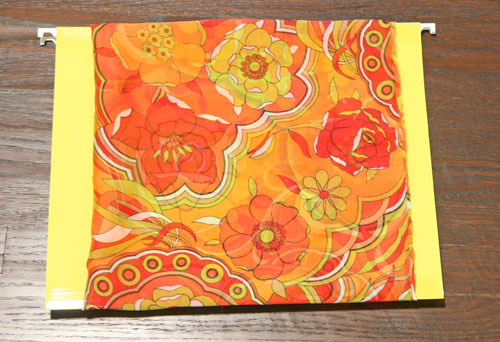 Then, lay your folder on top of the fabric, and fold one side in so that it just reaches the bottom of the folder. 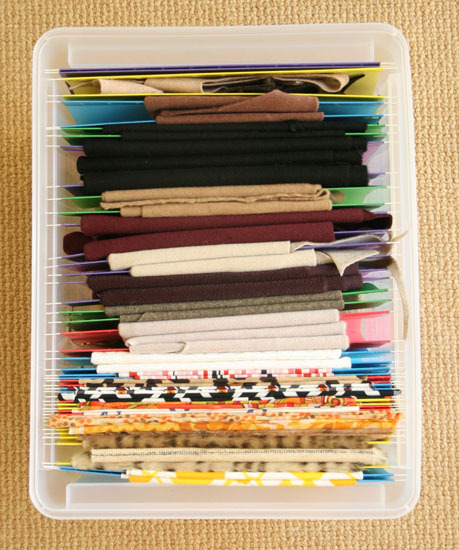 Now you will fold up the rest of the fabric on the other side of the folder, folding it over as many times as you need to make it fit neatly. Then, simply close up your folder. And then hang them all in the clear box. You can see in this side view how it keeps the fabric from dragging on the bottom and keeps it neat. You do need to have a pretty full box to make sure it stays neat. And it looks great. She does hers a little differently, so click on over there if you’d like to see her version. 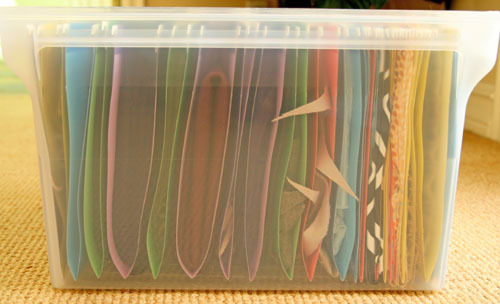 What I like slightly better about mine is that you can put a filing box anywhere, and the fabric is kept inside the folders and therefore very neat. But hers is great, too. 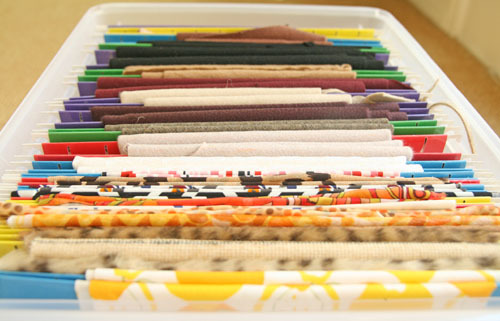 Do you have an ingenious system for storing fabric? I’m always open to new and improved! I bought this dish drying mat at The Container Store a while ago. I used to use a dish towel to put clean and wet dishes on, but it slides and sometimes it gets soaked through. Before that we used a wooden dish rack, but it’s such a pain to fold up and put back under the sink, and the underneath of my sink is pretty crowded these days, anyway. So I bought this drying mat. 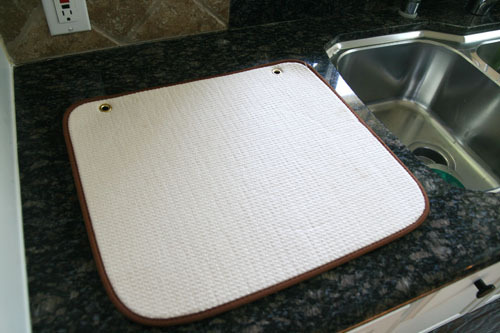 It’s the Original Dish Drying Mat. Tewtally gen-u-wine. But because it isn’t a towel, it doesn’t fold up when you want to put it away. So I devised my own system for tucking it away: I hang it on the inside of one of my cabinet doors. 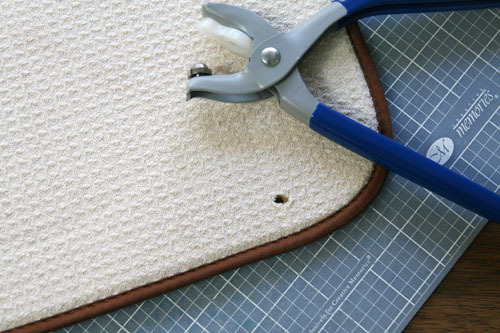 The grommet tool does pretty much all of this for you. First thing you’ll want to do is punch a hole with the tool where you want your first grommet. Since this mat has a small layer of foam in the middle, the tool didn’t really cut all the way through, so I had to use scissors to help it along. Once you’ve got your hole cut, you can insert your grommet. 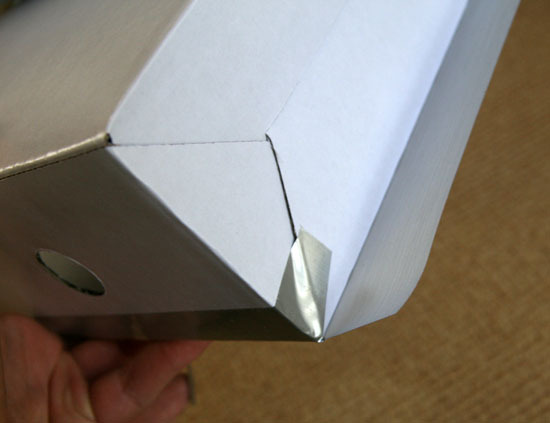 If you’ve never attached a grommet before, the tool’s packaging will give you all the instructions you need. Essentially, you put the male part through one side, put the female part on the other side, position the tool over them and then squeeze. 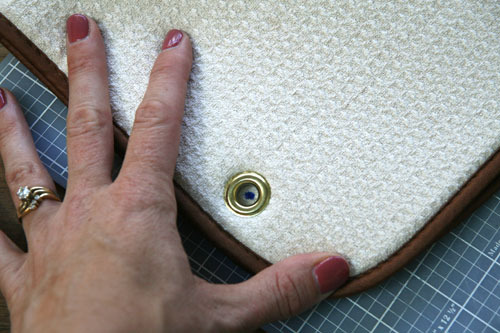 Once you’ve got the grommet attached, you can fold the mat over to position the second grommet hole. I used a Sharpie just to mark where I wanted the second grommet so that they’d match. Then I followed the same procedure as the first side. 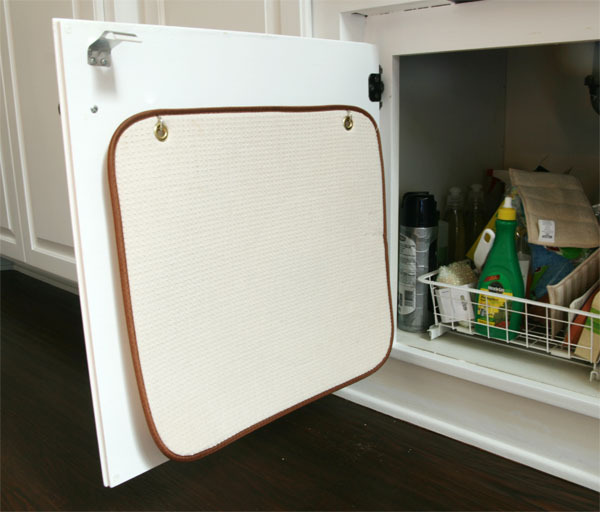 Now that the mat is ready, you simply need to install the hooks on the inside of the cabinet. 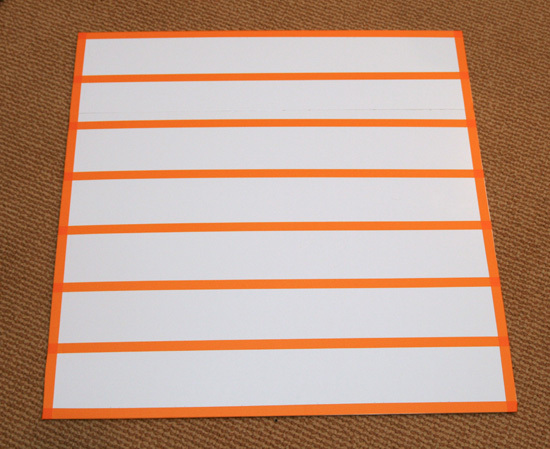 To make it easy, hold your mat up and mark the holes so that they match perfectly. Be sure that your mat will hang completely within the perimeter of your door. Use the nail to start a hole and then screw in each hook. 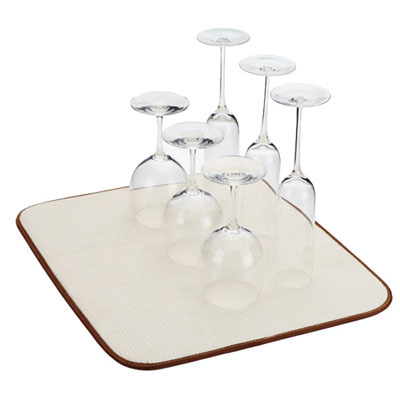 Now you’re ready to hang your mat! Tucked away nice and neat. Love! Since I’ve been reorganizing my kitchen, I decided to do something about the myriad cooking magazines that I have. But I didn’t want to buy a ton of those magazine files that I like, because they are expensive! 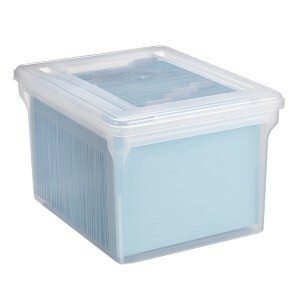 I bought two of these at The Container Store for my bedroom, and they were $11 each. If I bought the number I needed for the kitchen, I’m out nearly $50. Crazy! That’s the FLYT white magazine file. Wait for it… $1.99 for FIVE. Bargain! 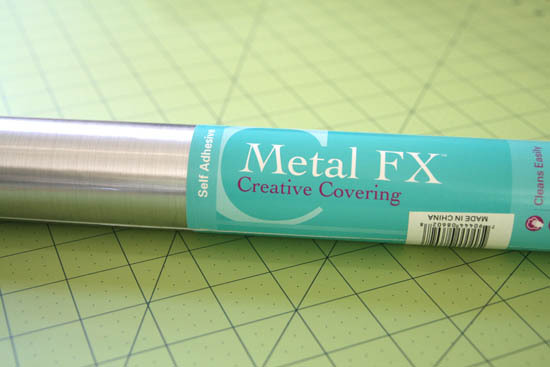 It’s contact paper that looks like metal. Awesome. 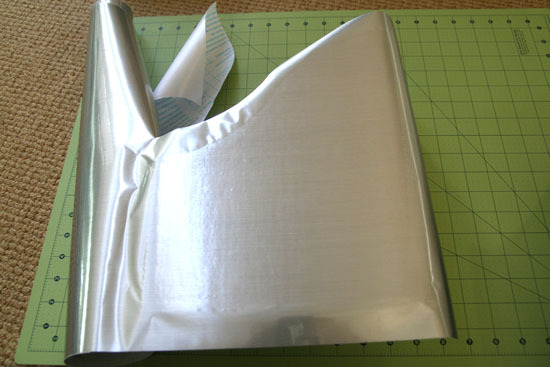 Here’s how I covered it so it looked like it was a magazine file made from metal. 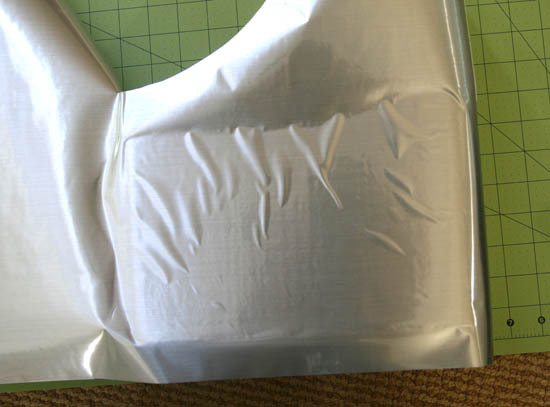 First, I cut the contact paper to a length that would cover all 4 sides of the file. Then, I laid out the assembled file, leaving about 1″ on the left side and about 2-3″ from the bottom, and traced the top of the first side. I also traced the short edge, and then the opposite side, and cut out the pattern for the top. This is all pretty straightforward. It gets tricky when you actually go to put the contact paper on. The easiest way to do it is in parts. 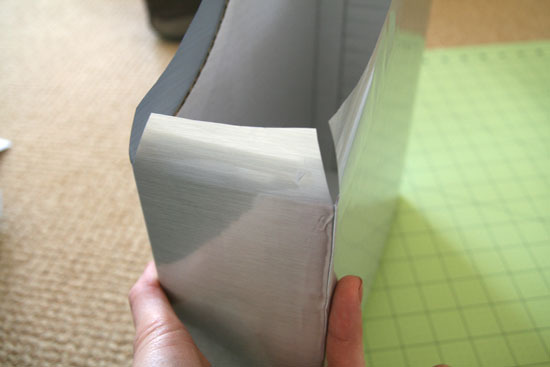 Then, holding your contact paper as taut as possible, you will lay the side of the magazine file on the paper. 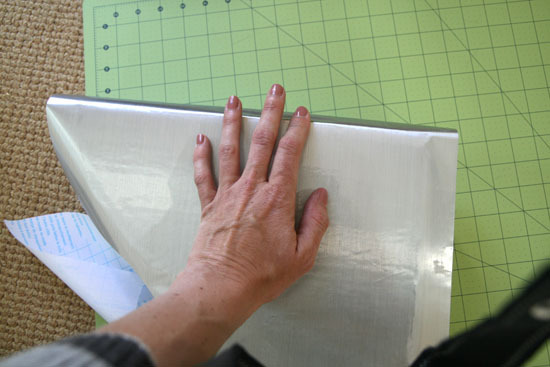 Note that you want to move it down an inch or two from the edge you cut so you will have enough of a margin to fold the top over. 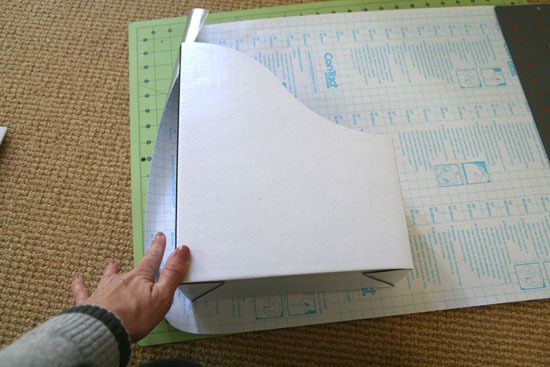 Once you’ve laid down the box onto the paper, flip it over. You’ll notice that it’s pretty lumpy. Here’s where you need to smooth out all the wrinkles before you peel off any more. You can use your hand and fingernails or, if you are fancy like me, a bone folder. Here’s what it looks like once you’ve smoothed it out. 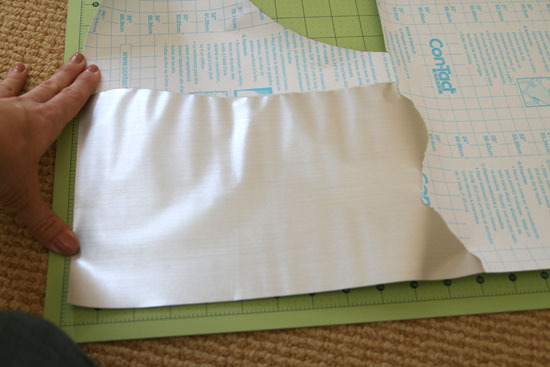 Then, you can fold back the top and start peeling off the rest of the backing for this first side. You can peel a bit at a time, sticking down as you go. It makes it much easier than peeling everything off at once and trying not to let the paper stick to itself. 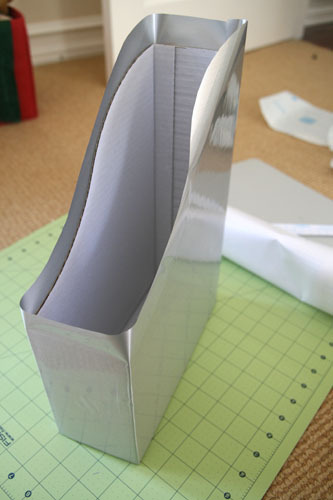 Once you’ve peeled that whole side off, placed it down and smoothed it over, it looks like this (above). 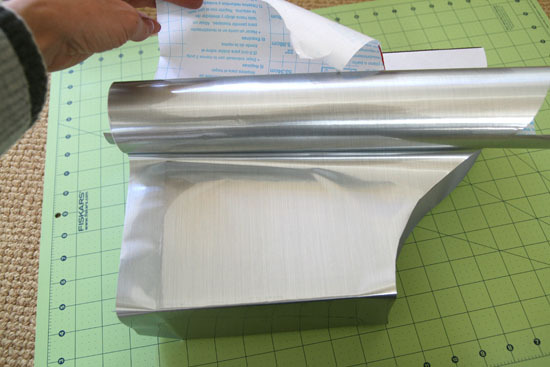 Now you will go back to that original 1″ flap that sits on the back edge and fold that over and smooth it. 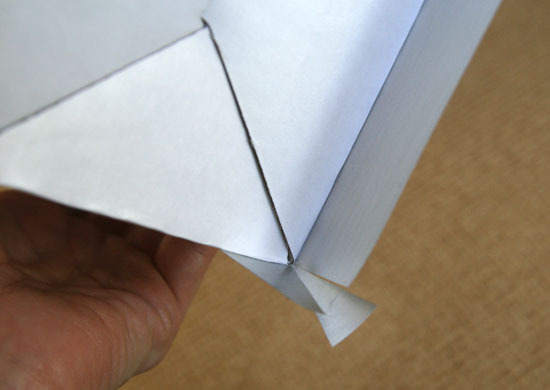 Once you’ve folded this one flap down, it’s time to move onto the front, short side. You will follow the same procedure, peeling a small amount of backing off and smoothing it down as you go. Then you can continue on to the second long, curved side. You will then continue around the back so that all the sides are covered. 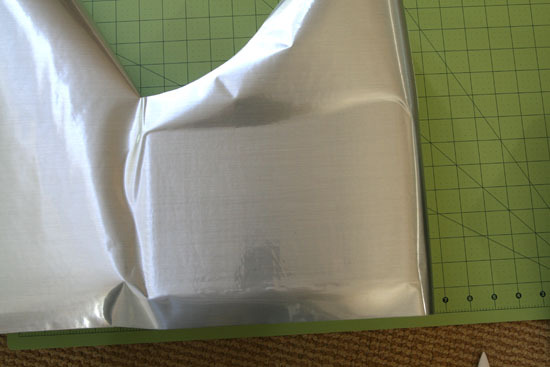 At this point, you will continue cutting the triangles at each corner and folding flaps under. Now it’s time to fold the top flaps in. Start with the front, short side, using the triangle technique from the bottom. 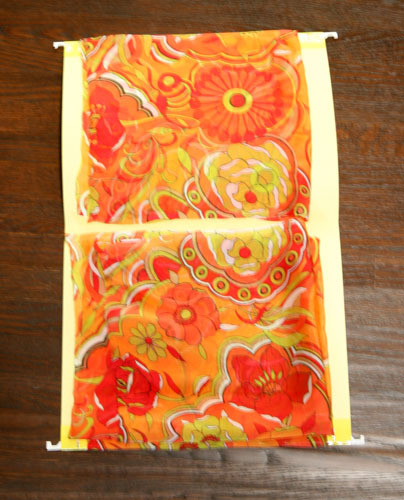 You’ll fold that front flap down and then move onto the first curved side. 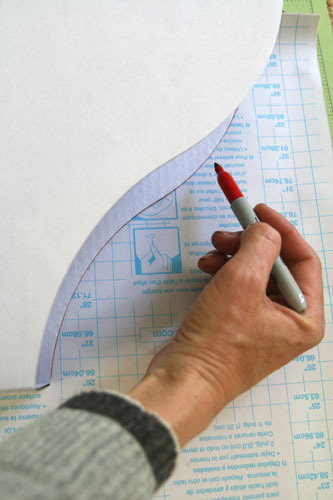 In order to fold it down, you will need to cut vertical slits at intervals so the paper can fold down smoothly, from the outside view. 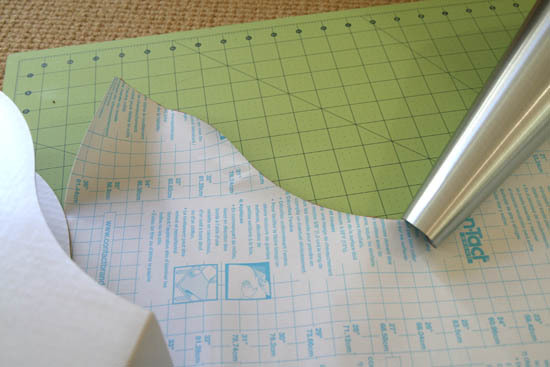 Note that while it looks like I cut triangles, I really just cut a slit; the way the paper folds down at different angles because of the curve makes it look like there’s more cut out than there is. Once you get to the back flap, you can repeat the procedure from the front, then repeat the curved side procedure down the second side. 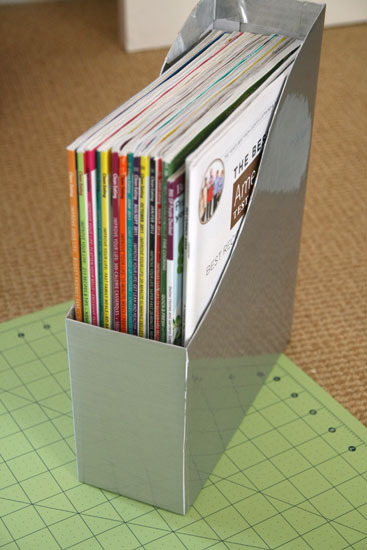 Put your magazines in and you are done! 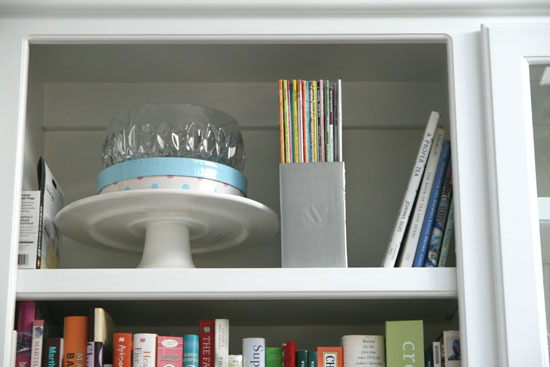 Sitting up there above my cookbooks. I still have three more of these to make, but first things first. 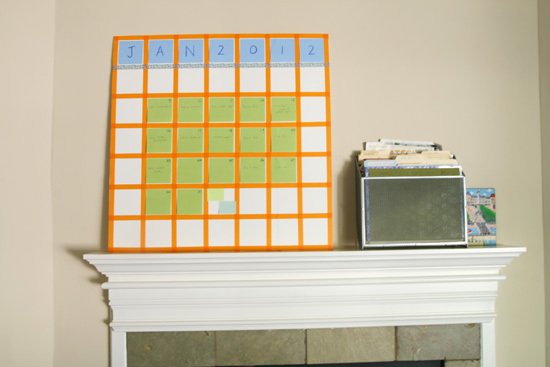 I recently saw this project over at Martha’s site, and it seemed like just the thing I needed to keep track of posts: a totally customizable and flexible calendar. It’s perfect as an editorial calendar, a place where I can keep track of all the posts I’m writing on different sites, especially since you can move the sticky notes around if you decide to change a post from one day to another. Will you be surprised if I tell you that Martha’s instructions are kind of off? No, you will not. It’s actually super easy to do. Get a piece of foam core, cut it to the right dimensions (more on this in a second), use washi tape to make a grid, get some pretty Post Its. Done. So, Martha, what up with 26 1/2″ square?!? If she used some other kind of washi tape, then it would have to be 11/16″, which seems like an awfully odd size of tape, no? I’ve never seen it in that size. In fact, all the tape I’ve seen is 1/2″. Unfortunately, I listen to Martha, so then I had the wrong size board. I had to do some 3 1/8″-type of finagling, but I figured it out. But if you want to make it right, then use a 25″ square board. 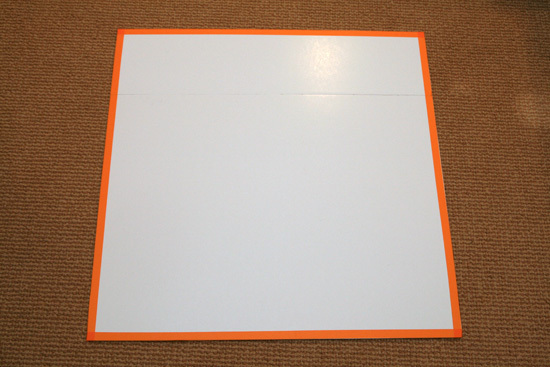 On another note, I bought foam core at Michaels, which is a 20″ x 30″ board. I bought two and cut off an extra 6 1/2″ from one and hot glued it to the other so I had the width I needed (or rather, the wrong width that Martha told me to use). I hot glued the edges together, which worked surprisingly well, and then I put some duct tape on the seam on the back for extra stability. But it works fine. 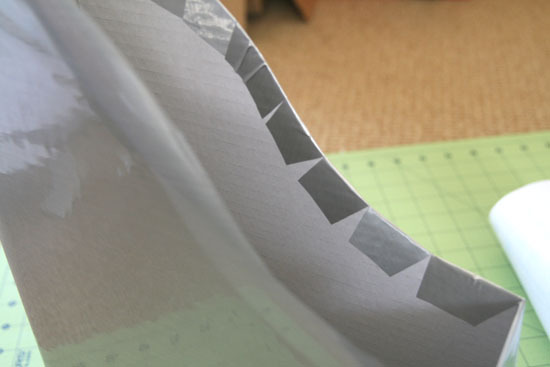 My suggestion here is to mark out 3″, 3 1/2″, 6 1/2″, 7″, etc, on both the bottom and the top, so that you have a set of 1/2″ wide marks at the top and bottom that guide you where to put your washi tape. 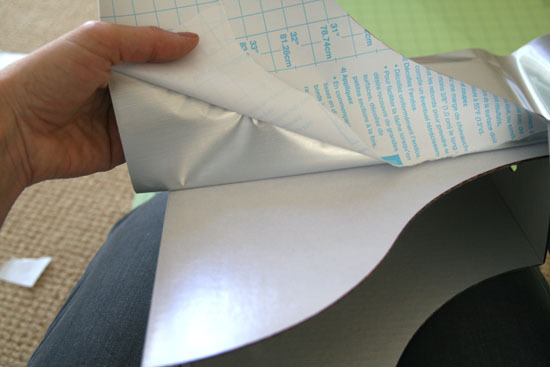 Attach it at the top, unroll a bunch without sticking it, and then, pulling it tight, line up the bottom guides. The tape in the middle will fall nicely into place. You’ll notice that I used a different pattern tape to divide the month and the year from the days. You know, just a little more fabulous than Martha. I’m still going to be tweaking a bit, since now if I move a post it moves the date with it, so I’ll have to figure out how to do separate dates. Maybe those little round price stickers or something, or something more reusable so I can use them every month. I’ll be sure to keep you posted. Do you have a calendar system you love? I have tried many, many, and I still don’t feel like I’ve found a total winner. This might be fodder for another post, though.